I thought this'd be a snap. The lawn needed mowing, a storm was coming and needed to be beat. And the carrots needed to sit before serving. I chose the stove over the lawn mower. The bad news is the storm hit before the carrots were done. (That's why they say, Tomorrow is another day.) The good news is the carrots turned out great and there wouldn't have been enough time to finish the yard anyway. But oh what a pile of dishes! Fill a Dutch oven or large pot with enough water to cover the carrots once they're grated. Add salt and bring to a boil. Prepare a bowl of ice water. Grate the carrots in the food processor. 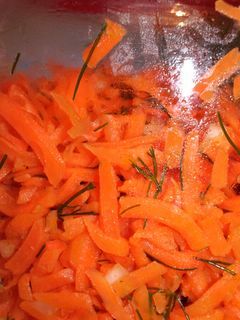 When the water boils, add the carrots. Leave them in the water for just enough time to cook lightly, maybe 1 minute. Drain and plunge into the ice water until cold. Drain again. Meanwhile, mix remaining ingredients. Stir in the carrots. Chill for at least 30 minutes, stirring occasionally if needed..